China’s most prominent human rights and democracy advocate and Nobel laureate Liu Xiaobo has died aged 61. Liu Xiaobo had been serving an 11-year prison term for “subversion” and was recently moved to a hospital due to a terminal liver cancer. A university professor turned tireless rights campaigner, Liu Xiaobo was branded a criminal by authorities. The Nobel Committee said the Chinese government bore a “heavy responsibility” for Liu Xiaobo’s death. He was repeatedly jailed throughout his life. When not in prison, Liu Xiaobo was subject to severe restrictions while his wife, Liu Xia, was placed under house arrest. Liu Xiaobo played a significant role in the Tiananmen student protests of June 1989 which ended in bloodshed when they were quashed by troops. He and other activists negotiated the safe exit of several hundred demonstrators, and have been credited with saving the protesters’ lives. Liu Xiaobo was subsequently placed in a detention center and released in 1991. His campaign to free those detained during Tiananmen landed him in a labor camp in north-eastern China for three years but he was permitted to marry poet Liu Xia there in 1996. 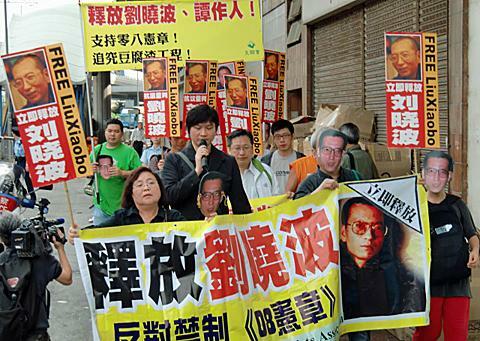 Liu Xiaobo was later freed, and continued to campaign for democracy. The 11-year jail term he was serving when he died was handed down in 2009 after he compiled, with other intellectuals, the Charter 08 manifesto. This was a call for an end to one-party rule and the introduction of multi-party democracy. Liu Xiaobo was found guilty of trying to overthrow the state. He was a pro-democracy figurehead for activists outside mainland China, although many of his compatriots were unaware of his struggles because the authorities rigorously censored news about him. Liu Xiaobo won the Nobel Peace Prize in 2010 for his “long and non-violent struggle for fundamental human rights in China”, but he was not permitted to travel to Norway to accept it. Liu Xiaobo was the second person to receive the award while in prison – the other was the German pacifist Carl von Ossietzky, who won in 1935 while incarcerated in a Nazi concentration camp.